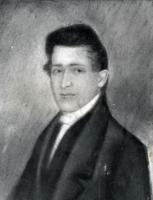 John Anthony Gardner Davis became the Law School’s second professor at the young age of twenty-eight. A native of Middlesex County, Virginia, he was once called by the president at his alma mater, the College of William and Mary, “likely to be the most distinguished man of his time, in Virginia.” He was admitted to the bar in 1822. Then, in 1824 he moved to Albemarle County where his wife (Mary Jane Terrell, a great niece of Thomas Jefferson) had many connections and took up his residence in Charlottesville. While practicing as a lawyer in Charlottesville, and with his habitual thirst for improvement, Davis enrolled in a science course at the university in 1825, becoming one of its first alumni. Davis also served as the secretary of the Board of Visitors prior to being elected professor of law in July of 1830, at the age of 28. Like his predecessor, he advocated a strict interpretation of the Constitution, following that of Jefferson and Madison. He, too, saw the need for the study of the law to include a broad-ranging liberal education. Davis served as chairman of the faculty for five years and authored the widely-used Treatise on Criminal Law, and Guide for Justices of the Peace, the first complete treatment of Virginia criminal law. He was the first of several law professors to reside in Pavilion X on the Lawn. Information about John A. G. Davis comes from a short sketch of Professor J. A. G. Davis that was prepared by Captain Eugene Davis, not long before his own death.